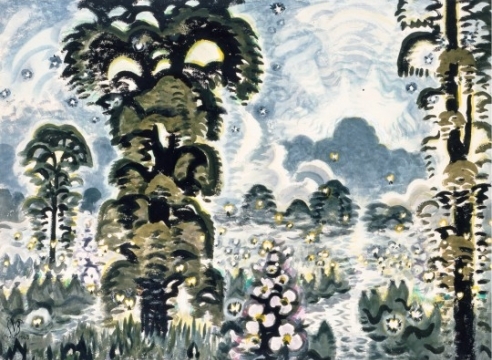 "Charles Burchfield: The Nature of Seeing"
Charles Burchfield was one of the most inventive American artists of the twentieth century. 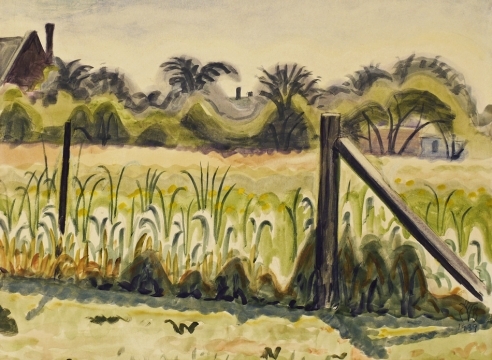 Throughout most of his career, watercolor was his medium of choice, sometimes used in combination with gouache, graphite, charcoal, conté crayon, chalk, or pastel. 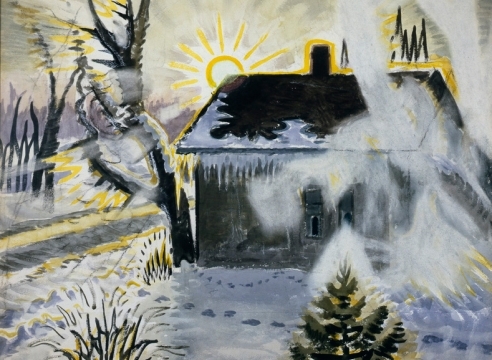 During Burchfield’s lifetime three major periods in his work were generally acknowledged: an early period dating from roughly 1915 to 1921 when landscape was often treated in metaphysical, fantastic ways; a middle period dating from the early 1920s to the 1940s when realism reigned; and a late period which marked a return to a transcendental, mystical perspective. 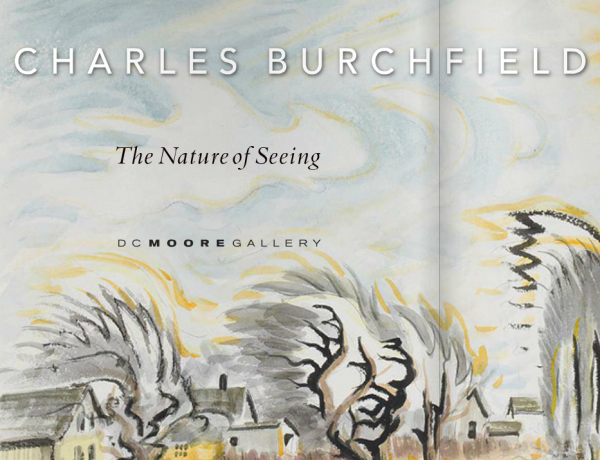 One of the most innovative artists of the 20th century, Charles Burchfield (1893-1967) continues to intrigue and inform the contemporary art world. His intensely personal, spiritualized view of the world resonates with artists who work in a variety of media, and his deeply felt, almost mystical sensibility has inspired curators and artists to revisit and reassess his many accomplishments. 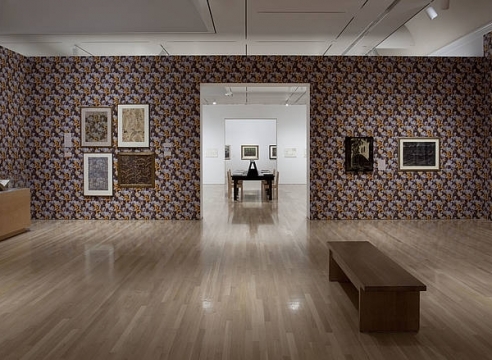 In 2009 Robert Gober organized a major retrospective for the Hammer Museum which traveled to the Whitney Museum of American Art. 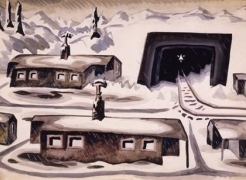 Born in Astabula Harbor, Ohio, in 1893, Charles Burchfield grew up in the small town of Salem, in central Ohio. During his youth, he spent countless hours in the nearby woods, developing a deep and life-long empathy for the natural world. 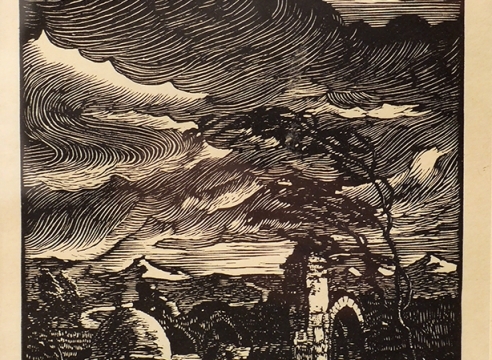 In 1912, he enrolled in the Cleveland School of Art, graduating four years later. 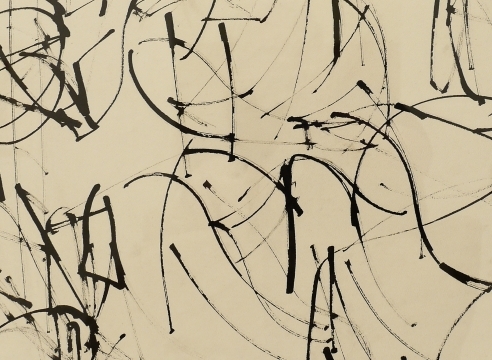 While there, he was introduced to major trends in European and American modernism, as well as Chinese and Japanese art, and contemporary design theory. 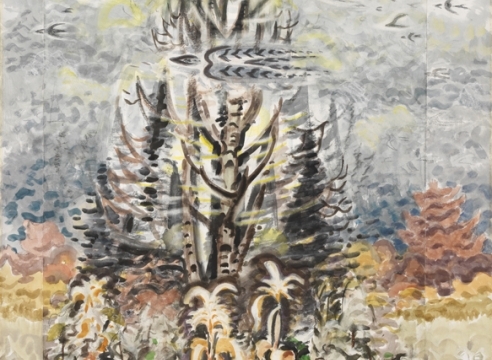 His early work included modernist views of Salem and the surrounding countryside, along with imaginative landscapes grounded in a personal visual language of fantasy. 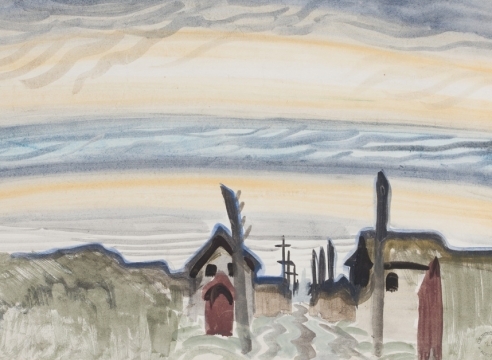 Around 1920, he adopted a more realist approach grounded in the austere imagery of industrial development, and the local architecture of Midwestern cities and towns. 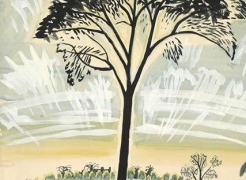 In 1921, Burchfield moved to Buffalo, New York, to work as a wallpaper designer for the H. M. Birge Company. He married and started a family, eventually raising four daughters and a son. 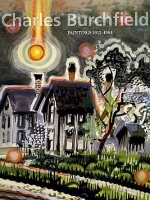 Around this time, he began to receive critical acclaim for his focus on what he once called the “great epic poetry of American life.” He had several exhibitions at the Montross Gallery in New York starting in 1924. 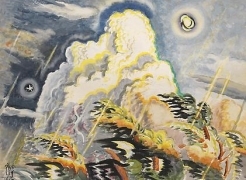 Burchfield gained major national recognition in 1930, when the newly formed Museum of Modern Art organized an exhibition of his early work. It was the first single-artist exhibition held at the museum. A year earlier he had joined the Frank K. M. Rehn Galleries in New York, which continued to represent him for the rest of his life. In the early 1940s, Burchfield returned to a bolder, more expressive approach. 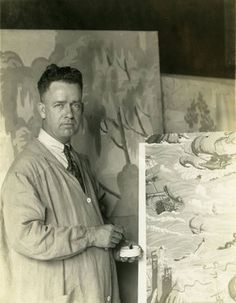 He was initially inspired to develop what he called “reconstructions” or “two-period pictures,” composites of smaller, early works, mainly from 1917 and 1918, which he enlarged with strips of paper to create grander, more complex compositions. 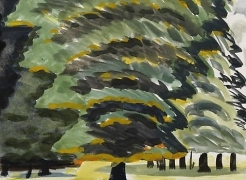 Much of his later work reveals two complementary sides of his artistic personality—from exuberant views of sunlit fields and atmospheric skies to more introspective meditations on the profound depths of nature. 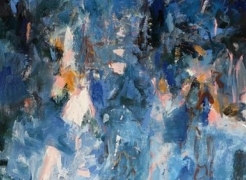 By the early 1960s, his paintings were increasingly dreamlike. 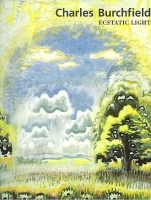 He continued to paint with his full creative powers until the end of his life. 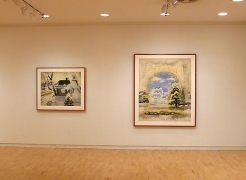 His final exhibition at the Rehn Galleries was in October 1966, three months before he died. 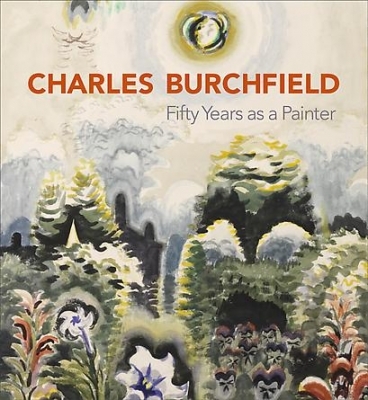 Charles Burchfield has been the focus of numerous museum exhibitions, including an exhibition of early watercolors at the Museum of Modern Art in 1930, and retrospectives at the Albright-Knox Gallery in Buffalo in 1944, the Whitney Museum of American in 1956, 1980 and 2002, the University of Arizona Art Gallery, Tucson in 1965, the Metropolitan Museum of Art in 1990, and the Columbus Museum of Art in Ohio in 1997. 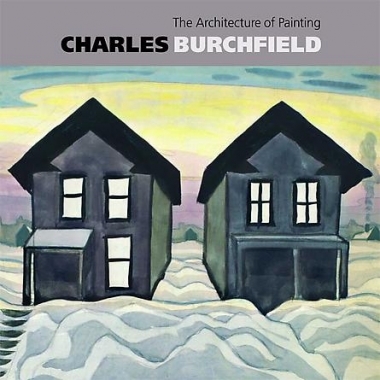 The latter exhibition, titled The Paintings of Charles Burchfield: North by Midwest, traveled to the Burchfield-Penney Art Center in Buffalo, New York and the Smithsonian’s National Museum of American Art in Washington, D.C. and was accompanied by a monograph by Nannette Maciejunes and Michael Hall. 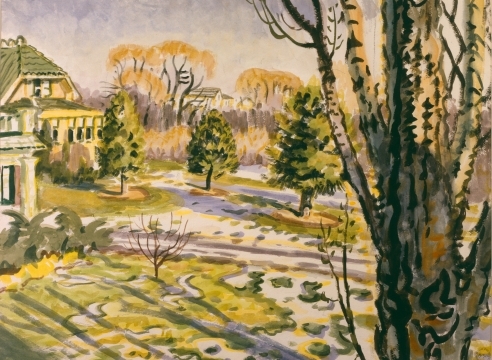 Burchfield’s work is represented in every major collection of American art in this country. For a complete chronology, please download the PDF. 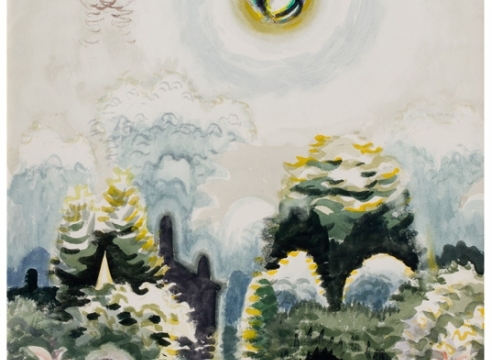 The New Yorker: "Charles Burchfield"
Artinfo: "5 Must-See Gallery Shows: Charles Burchfield"
Artforum: "Critic's Pick: Charles Burchfield"
The New York Times: Charles Burchfield, "Ecstatic Light"